A gang of six men who appeared to be legitimate businessmen, but were nothing more than “liars in suits” have been convicted with conspiracy to launder £750,000 at Guildford Crown Court. The men controlled bank accounts in the UK, Poland, Nigeria and Cyprus that received and then re-distributed money from an account in the UK that had been taken over by fraudsters. When challenged by financial institutions over the legitimacy of their transactions they cobbled together barely credible stories that fell apart under the scrutiny of Surrey Police’s financial investigators. One man even argued that he’d received £174,000 from a man that he’d met in a pub. Between November 2014 and March 2015, fraudsters took over a UK sterling account that belonged to a foreign national who was living in the USA. By demanding replacement cards, withdrawing cash from ATMs and over the counter, and transferring money to other accounts, the fraudsters were able to completely drain the account. Surrey Police financial investigators traced two of the transfers (totalling £400,000) to the personal account of Richard Whitehead (72) from Staines. After trying (and failing) to convert £180,000 to Euros and direct it to Nigeria, Whitehead passed £174,000 to Issa Mohammed Kabir (38) who sent £120,000 on to a company called Hypertech Nigeria. Kabir also withdrew £15,000 in cash and sent £30,000 to his girlfriend’s account in Poland. Meanwhile, Whitehead also passed money to Michael Frow (71), Dennis Smith (55) and Halford Brown (62). Further transfers were made from the hijacked account direct to Hypertech Nigeria and another company called Harrington Stone controlled by Shahid Maqbool (69). Whitehead and Frow told police that these transactions were for a feasibility study into a multi-million pound business deal building properties in Nigeria. Despite this neither of them were able to explain why the money was passing through their personal, rather than business, accounts; or why, when officers subjected their computers to a forensic download, there were no feasibility studies or related business documents for the deal except for a few invoices (all with a suspiciously similar layout). The prosecution argued that these documents were created purely for the purposes of making sure the transactions went through. Smith and Brown told police that they were paid a consultancy fee for locating a Nigerian man who had not paid Frow for work on the development. Halford Brown had family connections in Nigeria but was now running a Bureau de Change called Happy Money in Camden. Forensic computer work on Smith’s phones revealed chat messages that suggested he was willing to launder money. A notebook found in his home provided additional evidence with notes on Whitehead and Smiths bank details, and instructions for Frow on how to transfer money to Cyprus. Maqbool exercised his right to silence in police interview – he said absolutely nothing at all (not even “no comment”) but pleaded guilty in court. In police interview the last man, Kabir, denied knowing any of the other conspirators. This was despite claiming in his tenancy agreement that he was employed by Happy Money (the Bureau de Change run by Halford Brown). Kabir’s explanation for the £174,000 passing into his account was that he met a man called “David” in a pub who was having problems because his bank was shutting his account. Kabir agreed to accept £174,000 from “David”, and pay the money on to different accounts (including Hypertech Nigeria), in return for “David” buying Kabir a plane ticket to Nigeria. Kabir also denied any connection at all to Hypertech Nigeria – and argued that it was complete coincidence that he had previously been a director for three separate UK companies called Hypertech; had listed his employer in 2002 as Hypertech on a bank form and had a Skype contact called Hypertech22 on his computer. Kabir, Whitehead, Frow, Smith and Brown all pleaded not guilty but were convicted by the jury at Guildford Crown Court, after a five week trial, with conspiracy to launder money. Maqbool pleaded guilty earlier in the proceedings to a single charge of money laundering. A seventh man, Roy Attuh, was found not guilty. “These men tried to portray themselves as successful businessmen, but they were liars in suits. The stories they came up with to cover their transactions were laughable – they created the bare minimum of documentation to persuade the financial institutions to allow their transfers”. Issa Mohammed Kabir; age 38 of Sans Walk, Clerkenwell, London; pleaded not guilty to a charge of conspiracy to launder money. He was found guilty by unanimous verdict on 11 February 2019. Richard Whitehead; age 72 of Laleham Road, Staines upon Thames; pleaded not guilty to a charge of conspiracy to launder money. He was found guilty by unanimous verdict on 11 February 2019. Michael Frow; age 71 of Heath Hill Road South, Crowthorne, Berkshire; pleaded not guilty to a charge of conspiracy to launder money. He was found guilty by unanimous verdict on 11 February 2019. Dennis Leroy Smith; age 55 of Rabournmead Drive, Northolt, Hillingdon; pleaded not guilty to a charge of conspiracy to launder money. He was found guilty by unanimous verdict on 11 February 2019. Halford Brown; age 62 of Dalberg Road, Lambeth, London; pleaded not guilty to a charge of conspiracy to launder money. He was found guilty by majority verdict on 11 February 2019. Shahid Maqbool; age 69 of Runnymede Gardens, Greenford, Ealing, London; pleaded guilty to a charge of a single count of money laundering. A further man, Roy Janegwo Attuh pleaded not guilty to a charge of conspiracy to launder money. He was found not guilty on 11 February 2019. 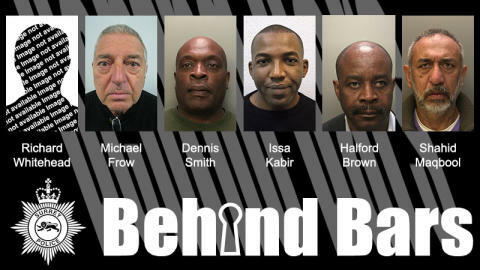 The six men will be sentenced on Friday 15 February.